Best Vacuums for Pet Hair Reviewed: Which One Stands out? Cashews are generally considered a nutritious snack for people. They are a good source of plant protein, naturally cholesterol free, and most of the fats found in cashews are unsaturated. Cashews are good for people because they are packed with vitamins, minerals, and antioxidants. But what about cashews for dogs? Cashews can be safe for healthy dogs when fed occasionally in small amounts, but there are numerous restrictions for cashew consumption by dogs. In addition, cashews must always be cooked or roasted prior to eating because raw cashews contain a toxin that is dangerous for people and dogs. Healthy omega-6 fatty acids are abundant in cashews, and when properly balanced with omega-3 fatty acids in a dog’s body, they can help heal inflammation. Omega-6 fatty acids also contribute to healthy skin and a soft, shiny coat. Cashews can help your dog’s healthy bone development as they contain calcium, magnesium, manganese, and phosphorous. Another health benefit of cashews is antioxidants, which may help reduce the risk of cancer and heart disease in some dogs. In addition, cashews are a source of dietary fiber, which aids in your dog’s digestion. Other nutrients in cashews include copper, folic acid, iron, vitamin K, and flavanols, which have detoxification and immune health benefits. Even though cashews contain healthy fats, they are too high in fat to be a regular part of your dog’s diet. A diet high in fat will cause your dog to gain excess weight and experience digestive discomfort. Cashews are also high in sugars and calories. Fats and sugars taste great to your dogs, but in high amounts they are detrimental to your dog’s health and moods. Cashews are high in plant proteins, but your dog needs meat-based proteins. If your dog eats a lot of cashews, the protein will make him feel full and decrease the amount of dog food he wants to eat. Replacing the dog food in your dog’s diet with snacks such as cashews can damage your dog’s health and lead to malnutrition. An occasional cashew snack is tolerable, but you should feed it to your dog four hours before or after his regular meal time so that you do not inadvertently reduce his appetite for dog food. Many varieties of cashews are unhealthy or even dangerous for your dog. For example, the chocolate in chocolate-covered cashews is poisonous to your dog. Most cashews are salted, and too much sodium is dangerous to your dog as well. Too much salt can cause sodium poisoning, a condition which can be deadly. Unsalted cashews are the only safe variety of cashews for dogs. Cashews are always sold shelled because the oil in cashew shells contains the same powerful toxin found in poison ivy. Any residual shell oil is eliminated during the cooking or roasting process, and raw cashews are never considered safe. Another dangerous toxin can be found in mold on cashews, so always inspect cashews for mold prior to feeding them to your dog. Ingesting moldy cashews can lead to liver failure in people and dogs. Dogs with a history of pancreatitis should never eat cashews because cashews are high in fat. If a dog ever suffers from pancreatitis, he should remain on a low-fat diet for the rest of his life as even a relatively small amount of fat can trigger another attack of pancreatitis, a painful inflammation of the pancreas. Cashews are strictly prohibited for dogs with a history of urinary problems because the high phosphorous content of cashews can cause bladder stones. Cashews are also risky for dogs that are prone to allergies. 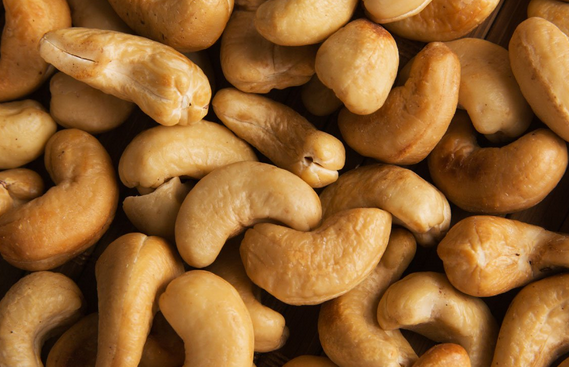 Allergic reactions to cashews are less common than reactions to peanuts and tree nuts, but are serious nevertheless. The symptoms of an allergic reaction to cashews are vomiting, diarrhea, excessive thirst, and in some cases, hives. Cashews are popular snacks with people because of their antioxidants, protein, healthy fats, and delicious flavor. While an occasional cashew snack is okay for a healthy dog, it can be dangerous for a dog that has health challenges. Frequent cashew consumption is not appropriate for any dog, and in some cases can cause serious illnesses. If your dog eats a cashew, it is not cause for panic. But considering the abundance of healthy dog treats that are available today, the safest choice is to avoid cashews altogether. A Hot Topic: Can Dogs Eat Red Peppers? A Fruity Question: Can Dogs Eat Limes? Mybonesandbiscuits.com is a participant in the Amazon Services LLC Associates Program, an affiliate advertising program designed to provide a means for sites to earn advertising fees by advertising and linking to Amazon.com. We truly appreciate the support, if you decide to buy using our affiliate links. It helps us keep the site going and to continue providing you with awesome content! Please see your veterinarian before feeding your dog anything or giving any medication. Safe Snacking: Can Dogs Eat Hummus?